For the first time since 1972, the Stanley Cup calls Boston home as the Bruins defeated the Vancouver Canucks in seven games to capture the franchise's sixth overall championship. And to witness the raising of the 2011 Stanley Cup championship banner to the TD Garden rafters is to witness New England sports history. Your Opening Night ticket, that features a cutting-edge die-cut design, deserves a championship display as special as the event. See below for details. 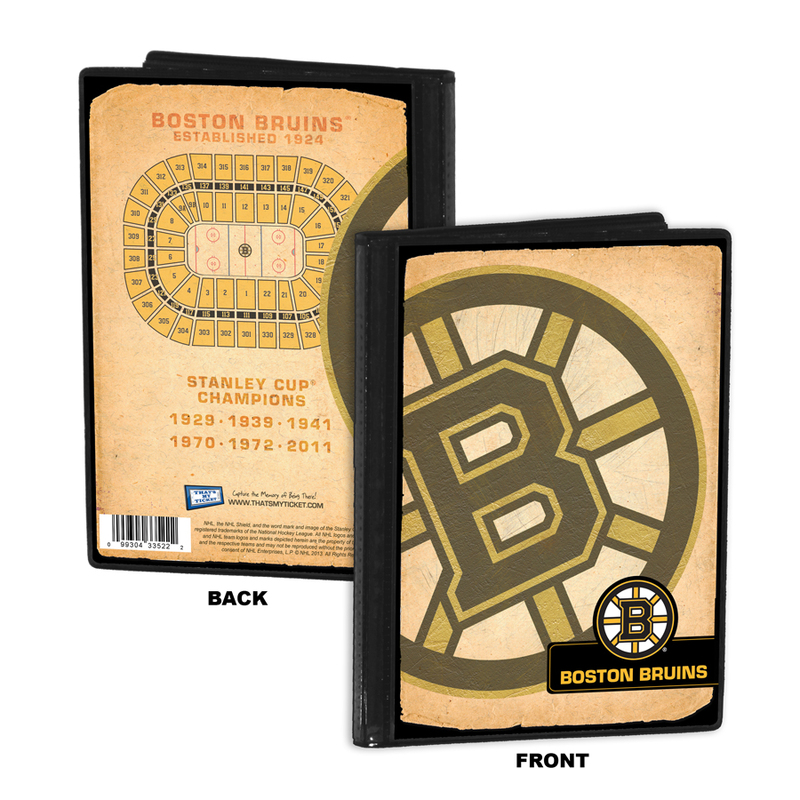 Placeholder for your Opening Night ticket that utilizes professional-grade mounting corners to preserve the condition and value of your ticket. Your ticket is the one item you can point to and say "I was there. That's My Ticket." Placeholder for your personal 4x6 photo taken during your Opening Night experience. Event placard featuring team logo and 2011 Stanley Cup championship banner graphic (as shown). 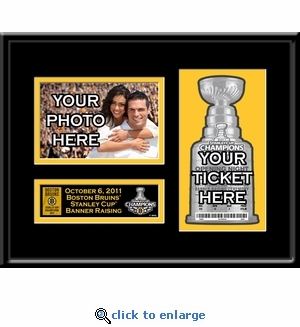 Includes easy-to-follow instructions for adding your Opening Night ticket and photo. As an option you can send us your ticket and photo and we will put them in free of charge and then ship your Ticket Frame ready to hang. Double matted in team colors using white-core mat board and a high-grade metal black frame for a board room-quality presentation. Overall size 14"(W) x 11"(H). Officially licensed by the National Hockey League. For the first time since 1972, the Stanley Cup calls Boston home as the Bruins defeated the Vancouver Canucks in seven games to capture the franchise's sixth overall championship. And to witness the raising of the 2011 Stanley Cup championship banner to the TD Garden rafters is to witness New England sports history. Your Opening Night ticket, that features a cutting-edge die-cut design, deserves a championship display as special as the event. See below for details.